I do bow and blades myself, here in Canada. I don't do electronics, but electric, sure. My plumbing is ok but I think throwing axes is silly. Especially if you have a bow. In which case, swing your axe but don't throw it away! 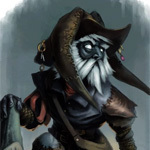 Don't sweat it, Vermin King! BTW: I made a good start tonight on a mod of cowboycentaur 's rideable horse. I am doing a "standing still" version, which will have fewer curves and therefore be quicker to build. 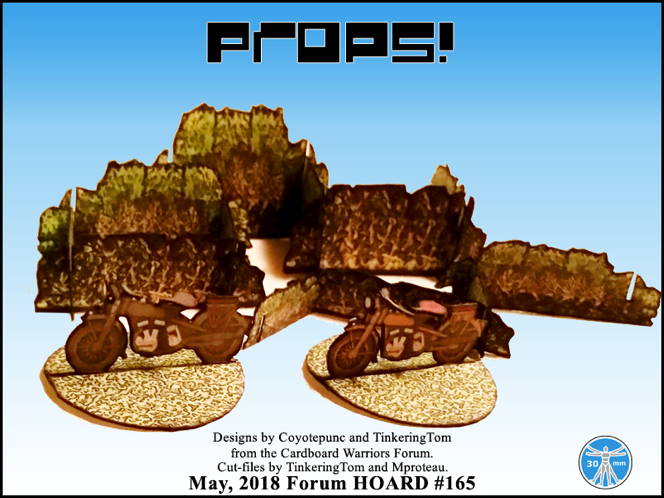 It is for the June Hoard. I made some stuff. How is everyone? I can get those added, but no more for this hoard. It is closed. There's actually some open space on two different pages that I think I can maneuver things around to get these added. I always start with the more involved parts, so the ossuary is done, the bushes and bikes are glued, but not cut out. The remainder is scored. 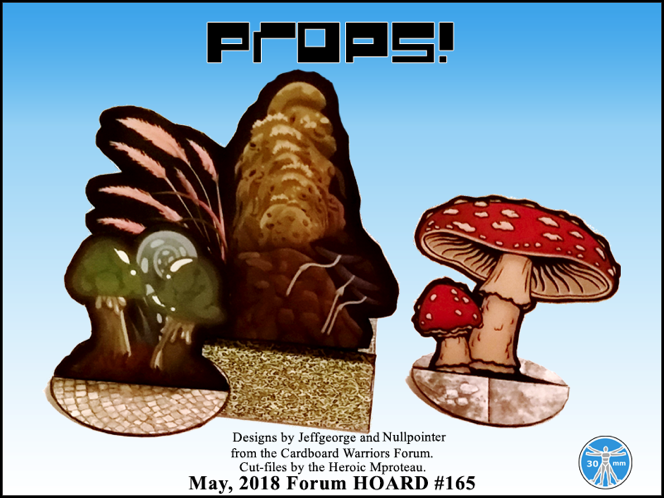 nullpointer (or anyone who knows), I need to do a base for the spore cluster. Is this a dungeon fungi or a woodland fungi? Ah hell, stop trying to be fungi! Spore-adically, I go through phases, where lame jokes slip out. All cut out - except for the 75mm base that needs texture and motorcycle parts. Yeah, underdark fungi are Huge! Vermin King I think its probably a cave fungus. Cleaning up the promo photos. Yesterday didn't go 'as planned'. Started off cleaning up the brush from Friday night tree trimming. Then one of the neighbor kids wanted me to check out a hole in their yard. It's like a small sink hole. Six feet down to the water, never could find anything to reach the bottom of the hole. Secured the area until it can be officially checked out. Back was sore, so trimmed one set of bushes at another neighbor's, and then cleaned my gutters. That neighbor has someone that she pays for doing lawn work, but he lets the edges get brushy, and so I cleaned that up again and then trimmed her Rose of Sharon that was about 18 feet tall. Discovered I am allergic to Rose of Sharon now. Still got three loads of the stuff disposed of. 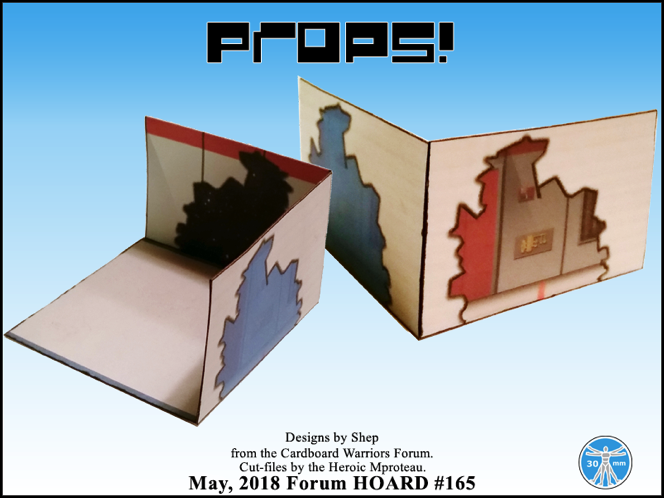 The month of May was bring out your props month! 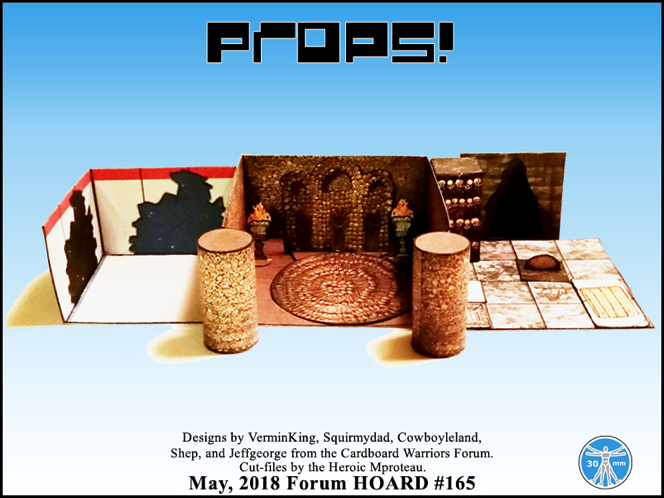 Thanks to Cowboyleland, VerminKing, TinkeringTom, Nullpointer, Jeffgeorge, Mproteau, Shep, and Coyotepunc for 'propping up' this latest Horde from the Cardboard Warriors Forum! squirmydad Wish I could take credit but it was nullpointer who designed the spore cluster and fungi. Well done to all involved; another excellent Hoard for the collection!